Click for a complete program in English and Spanish. On November 10, Too Big To Ignore will hold three special sessions at the 70th Annual Conference GCFI in Mérida, Mexico. The special sessions are examples of what TBTI have been doing in Latin America and the Caribbean, which correspond well with the theme of this year's GCFI, “Towards the sustainability of tropical fisheries strategies, models, and tools”. In addition to sharing lessons learned, we hope to generate discussion about the future of small-scale fisheries in the region, especially in light of the Small-Scale Fisheries Guidelines and the Sustainable Development Goals. 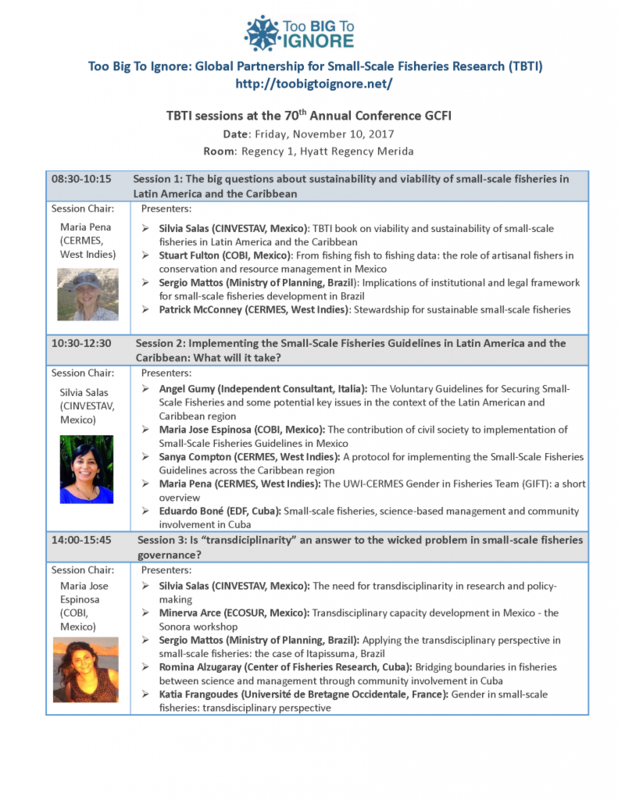 This session will firstly introduce the audience to the upcoming TBTI book on ‘Viability and sustainability of small-scale fisheries in Latin America and the Caribbean’. The speakers will present case studies from the region that examine factors and conditions for sustainability and viability of small-scale fisheries. SESSION 2: Implementing the Small-Scale Fisheries Guidelines in Latin America and the Caribbean: What will it take? This session will present some examples of early lessons and reflections on what is being done to overcome obstacles and support the implementation of the SSF Guidelines at various level, scale, and locations, which can be useful for the development of implementation strategies. SESSION 3: Is “transdisciplinarity” an answer to the wicked problem in small-scale fisheries governance? This session is an opportunity to share thoughts and exchange ideas about whether transdisciplinarity is indeed a solution to the ‘wicked’ problems in small-scale fisheries.